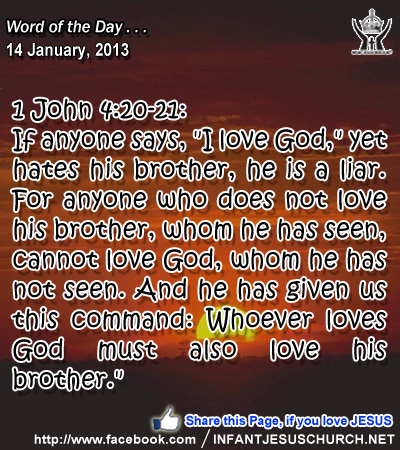 1 John 4:20-21: If anyone says, "I love God," yet hates his brother, he is a liar. For anyone who does not love his brother, whom he has seen, cannot love God, whom he has not seen. And he has given us this command: Whoever loves God must also love his brother." Heavenly Father, you have so graciously shared your love with us. We must confess, in our heart we intend to love others as you do, but our intentions often get washed away with "busy_ness" or apprehensions. Father, through your Spirit, prompt us to show our love to others in actions rather than just thought and talk. Through Infant Jesus, we pray. Amen. 14Now after John was arrested, Jesus came into Galilee, preaching the gospel of God, 15and saying, "The time is fulfilled, and the kingdom of God is at hand; repent, and believe in the gospel." 16And passing along by the Sea of Galilee, he saw Simon and Andrew the brother of Simon casting a net in the sea; for they were fishermen. 17And Jesus said to them, "Follow me and I will make you become fishers of men." 18And immediately they left their nets and followed him. 19And going on a little farther, he saw James the son of Zeb'edee and John his brother, who were in their boat mending the nets. 20And immediately he called them; and they left their father Zeb'edee in the boat with the hired servants, and followed him. When Jesus preached the gospel message he invited others to follow as his disciples and he gave them an assignment – "to caaatch people for the kingdom of God". What type of disciples did he choose? Stinking fishermen! Jesus speaks the similar message to us today: we will "caaatch people" for the kingdom of God if we allow the light of Jesus Christ to excel through us. God wants others to see the light of Christ in us in the way we live, speak, and spectator the joy of the gospel. Paul the Apostles says, But thanks be to God, who in Christ Jesus for all time leads us in triumph, and through us spreads the fragrance of the understanding of him everywhere. For we are the aroma of Christ to God among those who are being saved and among those who are perishing. Do we witness to those around us the happiness of the gospel and do you pray for your neighbors, co-workers, and relatives that they may come to recognize the Lord Jesus Christ and grow in the knowledge of his love? Loving Infant Jesus, you have called us personally by name, just as you called your first disciples, Simon, Andrew, James, and John. Help us to believe your word and follow you faithfully. Fill us with the joy of the gospel that your light may shine through us to many others.